United Kingdom citizens are in full swing for Daily Fantasy Sports competitions through the ever growing platform, DraftKings. The daily fantasy sports titan officially opened its doors to UK residents in 2016, offering them the same service that they provide in the United States. Over the last two years, DraftKings have ramped up tournaments, bonuses, and continues to expand in which sport competitions they will offer for their users. For UK DFS fans, this is an incredibly exciting time, as it means that they can try their hands at one of the largest and most popular fantasy sports websites with the chance to add up to £400 of bonus cash to their bankroll. Read on for our DraftKings UK Review and a step by step process on claiming your DraftKings bonus. Currently, DraftKings shares the top spot with FanDuel as the greatest daily fantasy sports provider. The platform is available to citizens in the majority of the United States, the United Kingdom, Germany as well as Canada. DraftKings decided to offer its services to United Kingdom players based on the UK’s love for sports and the gigantic sports betting industry that is centered out of the UK. The UK Gambling Commission licenses UK DraftKings and welcomes the game of skill into the market. They received this license in August of 2016, making them the first major DFS site based in the US to open its doors to the European market. At the moment, the DraftKings UK platform has an exclusive offer for all new players who sign up and make a deposit! When you deposit directly after signing up for a new DraftKings UK account, you are eligible for a 100% Matching Deposit Bonus of up to £400 as well as a FREE entry into a $3 contest to try out the platform! Sign up for a DraftKings account through our link! Receive your Match Bonus Cash in your Account! You'll also receive a FREE ticket to the Fantasy Football Striker Contest, normally a $3 value! Select 8 football players from the matches happening that day, while staying within the salary cap! When you receive your bonus cash up to £400, it will be visible in your bankroll as bonus money. Bonus money does hold playthrough requirements before you are able to withdrawal any of it. However, the playthrough rate is not too difficult at a $1 for every 100 FPP’s (Frequent Player Points) you earn. You will have 120 days to unlock the entire bonus, which makes the deposit bonus cash perfect for padding your high payout competition or tournament entries! DraftKings has done an excellent job improving the UK DraftKings platform, offering an ideal entry and now experienced level DFS site for their UK customers. The site allows UK residents to play the same games as their Canadian and US counterparts, which allows them access to a vast array of daily fun games and fantastic cash prizes. However, DraftKings UK also offers a higher number of DFS competitions through the Barclays Premier League matches that are so reknown within the UK. Now that DraftKings shares player pools between the United States, Canada, and the UK, there are far more competitions on the platform in any specificity as well as far more tournaments with huge payouts available. DraftKings is known for its excellent bonuses and promotions, and offers new players a substantial deposit bonus match of up to £400. Also, you can always try a real money competition for free just for signing up on DraftKings UK. Due to there being a large number of players per game, it is incredibly easy to locate a Daily Fantasy Sports Game to suit your tastes if you are new to the gameplay. In addition to some of the more popular sports in the UK on DraftKings, as the market grows within the country, so too will the variety of games that available to UK-based DFS fans. If you choose to join the DraftKing’s VIP or loyalty program and regularly play on the website, you can gain plenty of rewards like DraftKings merchandise and free entries to contests through the all new Frequent Player Points (FPPs). The UK DraftKings website is extremely similar to the one that US players have been playing on for years now. The product launch in the United Kingdom was always planned to model after the success found in the US DFS market, and to its surprise, DraftKings continues to thrive now on both continents. Since DraftKings first got its start years ago in 2012, it has grown into the largest biggest DFS provider around the globe. One of the greatest perks for UK players is that DraftKings gives them the ability to play in player pools that are shared by their North American counterparts, given them access to much larger prize pools and a variety of leagues that fit their liking. As the moment, DraftKings UK is available on all mobile devices through an app for both Android and iOS. If you are an Apple user, then simply head over to the App Store and download the platform for iPad, iPhone, or iPod Touch. For Android tablet and smartphone users, the app is currently available for download on the Google Play Store. The two apps for the different mobile device types have differed slightly in the past but now are relatively the same. The iOS version was said to be more responsive and intuitive while the Android version was more simplistic and a little clunky first out of the gate. However, these differences have been erased through various improvements, giving iOS Android users an ideal DFS gaming experience alike. Although the web interface via the desktop version of the platform is often referred to as the better tool for players who are entering into multiple competitions at once, mobile devices are holding strong to the test. DraftKings has made strides in management feasibility within both iOS and Android versions of the app, making it easier for players to compete on a high level on the go. 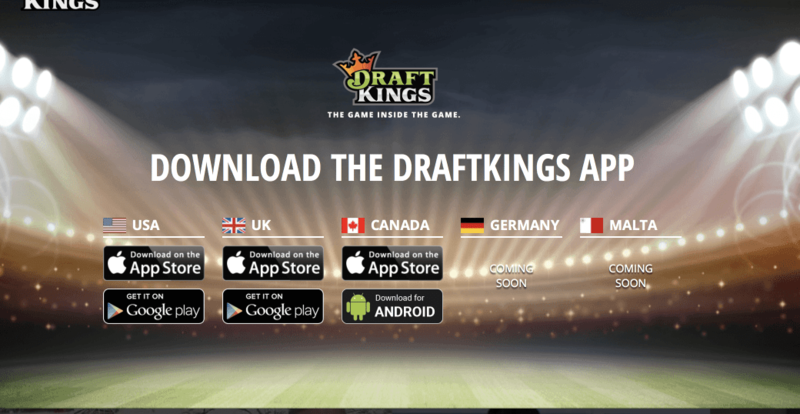 The UK model of the DraftKings platform proves to be almost identical to that in the US. Every type of competition that is offered in the US is also available to UK players and most competitions will have pools of shared players from both countries. In fact, there is only minuscule product differentiation between the UK and US platforms. Let’s take a quick look at the different types of contest options you have. This is a simple game type that only requires that you pay an entry fee and then pick your fantasy team. Once you have entered, your team will go up against others that have also been entered for a chance to win a part of the guaranteed prize pool. Try your hand at a one-on-one battle with another player for a previously agreed upon entry fee. This is a winner takes all game type to gain the most fantasy points. These fantasy events allow you to nearly double your money as long as you place in the top 50 percent of the competition. If you do place, then your money will be doubled. This is an easy way to play DFS and an excellent way to dip your feet in if you are new to the gameplay and not sure how all the rules work. League based fantasy sports games are extremely popular in the UK, and so residents will be quite used to the traditional form. You may enter a league that is accepting players or even create your own league for between 3 and 50 players. Small leagues usually have a winner-take-all style, while bigger leagues will reward the top players. Qualifiers are similar in nature to poker tournaments. They allow you to enter into extremely inexpensive events with the chance to gain free entry into a more costly event. DraftKings offers tournaments in which only a small number of players in the pool will win a large prize compared to the entry fee, which thus multiplies their entrée fee cost. The amount won depends on the number of people playing and the tournament fee. A Steps tournament lets you complete a tournament by placing in winning spots for every event, which allows you to progress to the next level. Although difficult, you may enter with only a small entry fee only to proceed through the steps that allow for a much larger prize pools. If you are new to DraftKings UK, the site does an excellent job of pairing up beginners with one another to gain experience and get a solid feel for the gameplay. UK DraftKings currently offers eight varieties of sports that you can play DFS with. The majority of these are based in the US. However, Soccer games are available, which will likely be of the most interest to UK customers. DraftKings has also stated that they are looking into providing a more UK-oriented service by opening up gameplay in Rugby and Cricket. You can use credit cards, debit cards, and PayPal to make payments on your Draftkings account as a UK player. When making a deposit, you must adhere to the conversion rate that is used by DraftKings to convert the British Pound to a Dollar, since DraftKings uses the US Dollar as their base currency. Once you’ve agreed to the conversion rate, the balance will convert right away to the US Dollar. When making a withdrawal, any money that is transferred to you is transferred through the same method that you made the deposit and will be converted back into the British Pound. 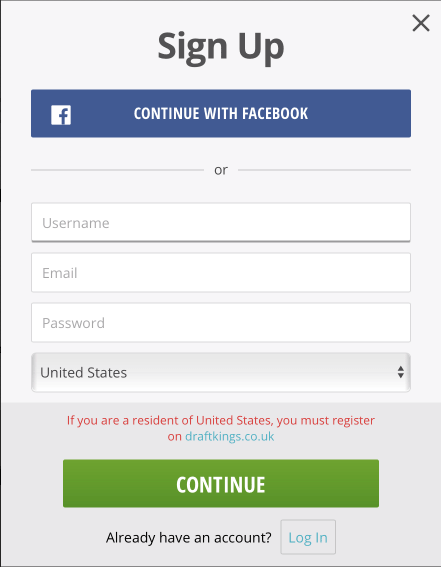 Signing up for a UK DraftKings account is a simple process. You can sign up either through web browser desktop version or through the mobile apps. For mobile signups, you must download the app to your iOS or Android device first. Once it has been downloaded, you must click on the Sign Up Button and proceed. It will ask you to create a username and password, as well as enter your date of birth and Email. For deposits, you will need to verify your identity to ensure player safety. For all residents of the United Kingdom, the DraftKings UK platform is the clear top choice in regards to DFS options. DraftKings major competitor, FanDuel, announced ahead of the 2017 BPL football season that it would not be renewing its UK license, pushing DraftKings to an easy number one. DraftKings is considered a titan in the US world of daily fantasy sports, and now UK players get to experience all of its thrills while playing competitions through the sports they love. DraftKings UK has made entering the DFS world easier than ever through solid promotions and the cash packed events happening year round. DraftKings UK is definitely worth trying, especially with the big starter bonuses currently offered and the ability to find the exact game type for you. When playing on any platform, it is always important to know your limits. Have fun and good luck!